Home » Blogs » What Happens in a Partial Government Shutdown? Policymakers have until midnight on Friday to avoid a partial government shutdown. Lawmakers have already passed full-year appropriations for five of the 12 appropriations bills: Defense, Labor-Health and Human Services-Education, Military Construction-Veterans' Affairs, Energy and Water, and the Legislative Branch. The seven remaining appropriations bills are currently being funded through a two-week continuing resolution scheduled to last through Friday. Conveniently, the fully funded appropriations bills, which would be unaffected by any shutdown, constitute roughly three-quarters of total discretionary spending (see below). Still, that leaves one-quarter of appropriations that would have to shut down. The seven bills that would be affected by a partial shutdown include Agriculture, Commerce-Justice-Science, Financial Services, Homeland Security, Interior-Environment, State-Foreign operations, and Transportation-Housing and Urban Development. 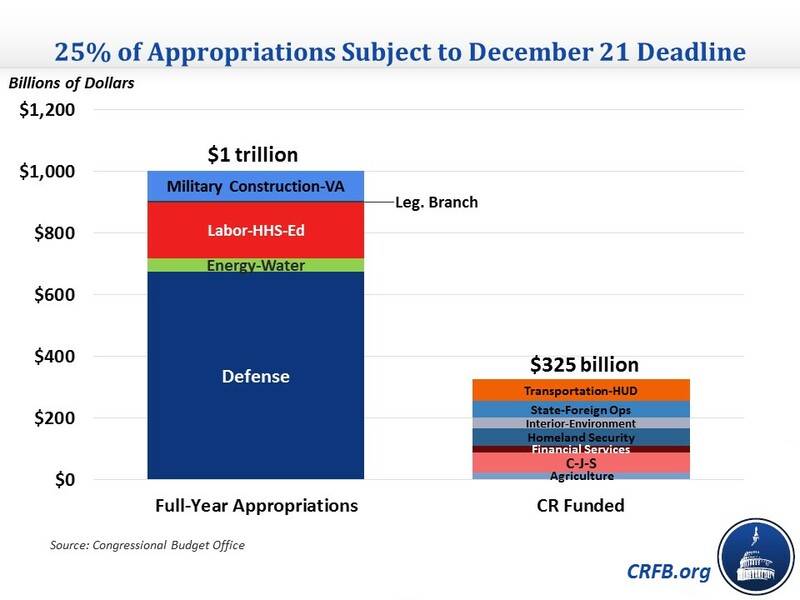 Together, they constitute about $325 billion of spending over the course of the fiscal year in the current CR, though they could be slightly higher in final appropriations since non-defense spending is currently under its FY 2019 cap. Though the agencies contained in these bills would be affected by a government shutdown, they wouldn't shut down wholesale if that happened. As we've explained before, functions considered essential (generally those necessary to protect life and property) and functions not funded by appropriations would continue during the shutdown. Other functions would cease, though, and those employees would be furloughed and given backpay after the shutdown ended. The Office of Management and Budget (OMB) has a list of contingency plans that agencies have developed in recent years in the event of a shutdown. The effect of the shutdown varies significantly by department. The Departments of Justice and Homeland Security would be less affected by a shutdown since both expect that about 85 percent of employees would be exempt. On the other hand, the Departments of Commerce and Housing and Urban Development would only exempt about 15 percent and 5 percent of employees from furloughs. The shutdown could have significant effects on departments. Functions that would be stopped during a shutdown include entry into national parks, Environmental Protection Agency (EPA) site inspections, refunds and audits by the Internal Revenue Service, several Federal Aviation Administration activities outside of air traffic control services, and vehicle safety activities and research. In short, the effect of a partial shutdown would vary across the government. A significant portion of appropriations would be unaffected since it is already funded through the end of the fiscal year (September 30, 2019) while some appropriations affected by the shutdown would still largely function as normal, and other parts would largely shut down. It would be better not to see a partial shutdown in action and for lawmakers to agree on appropriations on a timely basis.